The following tools and resources will provide you with information on how to keep safe when working in roadside work zones. The focus is on roadside work where planned work does not exceed one daytime work shift and certified traffic control persons are not required. Choose an option below. High-visibility garments are a type of personal protective equipment (PPE) and improve how well workers are seen. This resource outlines the different types of high visibility garments required by WorkSafeBC. This resource provides information on potential hazards in roadside work zones. A safety checklist is provided. Learn more about the key elements of a work zone layout, and things to consider in the proper set up and dismantling of roadside work zones. Have you ever experienced a near miss? Tell us your story by completing this short questionnaire. Check out how much you know with our five-question quiz. 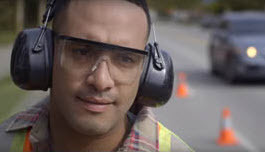 It’s a fun way to learn how to improve your safety in roadside work zones.